4th Japan Invention Machine User Group Meeting, held at Shirahama, Wakayama, Japan, on September 10-12, 2003. This paper was presented as shown above at the 4-th Japan IM User Group Meeting in September last year. The presentation was amazing and described the details of successful promotion of TRIZ at Samsung SAIT. Mr. Hyo June Kim talked in English with slides written in English, and Dr. Yoshihisa Konishi of MRI translated his presentation into Japanese showing slides written in Japanese and projected on the second screen. In addition to this paper, Mr. Kim also gave five more papers of case studies. Hand-outs were written in English and in Japanese in parallel, after the thoughtful arrangement by MRI. Throughout the Meeting, Mr. Kim and Dr. Nikolai Shpakovsky (originally from Belarus and working at SAIT at that time) were at the center of informal group discussions, giving so much impact on TRIZ community in Japan. Recently at TRIZCON2004 held at Seattle on April 25-27, three presentations were given by Samsung people. The promotion and practices in Samsung are clearly the outstanding success among the industries all over the world, as far as I know, as I wrote in my Personal Report of TRIZCON2004. It is remarkable that Mr. Kim has just published a Textbook of TRIZ in Korean Language. It has approximately 450 pages, with 400 illustrations. Samsung bought 1000 copies already and is going to add more along the spreading of the needs of TRIZ training, he says. Thank you for invitation of this web site. I started TRIZ work from April, 2000 year. Before TRIZ job, I was researcher of 4.7GB DVD-R media. Because of characteristics of my research, I could do more than 20 experiments everyday, so I spontaneously could be the expert of Design of Experiment and Taguchi method. From April, 2000 year, Russian TRIZ expert, Vassili Leniachine, Nikolai Shpakovsky, Nikolai Khomenko etc, who was employed by SAMSUNG, helped me. I was also helped specially by Sergei Ikovenko, Mikhail Rubin etc. Until now, I could apply TRIZ more than 150 projects. Maybe the probability of economical success of TRIZ consulting is about 30%. The probability of Idea generation by high level patent can be maybe more than 70%. I also spread TRIZ to many SAMSUNG divisions, including SEC (Samsung Electronics), SEM (Samsung Electro-Mechanics), and SDI etc. In the case of SEC, my division SAIT (Samsung Advanced Institute of Technology) helped SEC’s DVD pickup development and could achieved more than 0.1 billion dollars. By this event, SEC also employed 4 Russian TRIZ expert and made TRIZ team. By the similar process, SDI, SEM also made TRIZ team. From September 2002 year, I started TRIZ education course in SAMSUNG, SAIT division. Until now more than 1000 people was educated. 2004 year, I received the certification of TRIZ Specialist, which is the degree of Level 4 after Level 5, TRIZ Master. This year I published TRIZ Korean book based on my experience of TRIZ consulting and education. I put all my everything into this book, named “Creativity of Thinking”. So I will re-start for one more level of TRIZ research. I will continuously attend Invention Machine User Meeting by MRI in Japan for sharing good experience of Japanese TRIZ experts. You can see me in www.TRIZacademy.net. There is many movie file of my lecture in Korean using QuickTime player. Anybody who wants to contact me, please send e-mail to triz@samsung.com. held at Shirahama, Wakayama, Japan, on September 10-12, 2003. 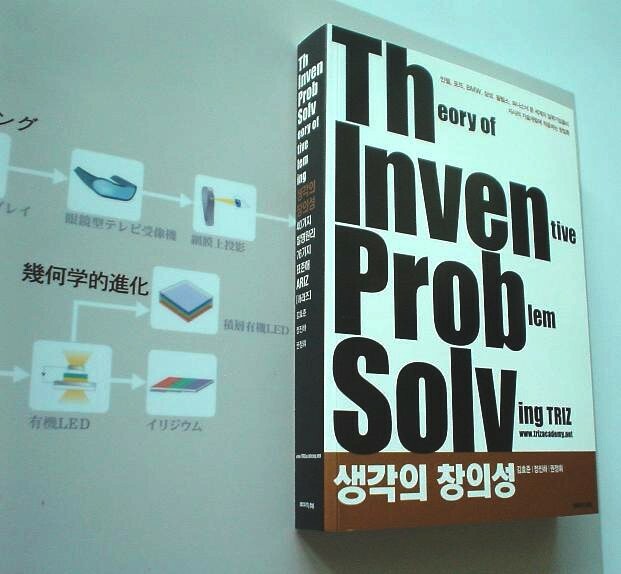 "Theory of Inventive Problem Solving: TRIZ" (in Korean) by Hyo June Kim, 2004.